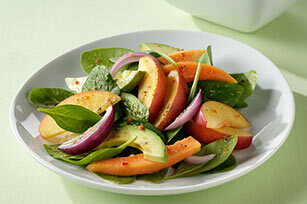 Shake up your routine with this colorful, fruit-infused Papaya and Avocado Salad. This better-for-you salad is prepared with fresh fruits and vegetables for a delicious dish, and the deep colors of Papaya and Avocado Salad make it a pleasure to present as well. Select avocados based on when you will be using them. Select softer avocados if you will be using them right away, and firmer avocados for later use. Let firmer avocados stand at room temperature until desired ripeness. Small light brown markings on the skin are normal and won't affect the quality of the fruit. Prepare using KRAFT Fat Free Thousand Island Dressing. Brighten up your next meal with this colorful salad that contains spinach, which is high in vitamin A, and papaya, a good source of vitamin C.